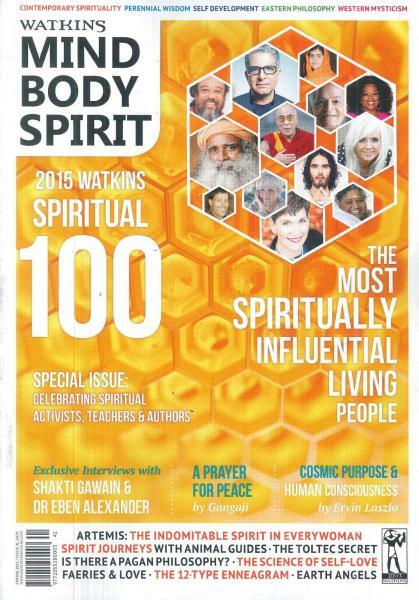 (TibetanReview.net, Feb25, 2015) – Tibet’s exile spiritual leader, the Dalai Lama, has been listed as the most prominent spiritual figure in the Watkin’s Mind Body Spirit magazine, UK, which features the 100 Most Spiritually Influential Living People in 2015. This is the fourth year the 1989 Nobel Peace Prize winner has topped the list. The Dalai Lama was followed by German spiritual teacher and writer Eckhart Tolle and Pope Francis in that order. Others in the list include the Vietnamese Buddhist monk Thich Nhat Hanh (fourth), South African retired Anglican bishop and social rights activist Desmond Tutu (fifth), Brazilian novelist and author of The Alchemist Paulo Coelho (seventh), American talk show host Oprah Winfrey (eighth), and Chilean filmmaker and director of El Topo Alejandro Jodorowsky (fifteenth). The magazine, which began compiling its “Spiritual 100” annually since 2011 in the spring issue of this quarterly publication, lists the most spiritually prominent people of the past year based on three factors. Those on the list have to be alive as of Jan 1, 2014; should have made a unique and spiritual contribution on a global scale; and have to be frequently googled, appeared in Nielsen Data, and have to have been actively talked about throughout the Internet. The list is derived from spiritual database of over six hundred candidates from around the world. The top 100 are seen as the most proactive individuals and range from political and religious leaders to writers, filmmakers and artists. The Watkin’s Mind Body and Spirit magazine is published by Watkins Books, England’s oldest and largest esoteric bookshop that has been in business since 1893.